To many readers this will be no more than the name of a line in Leicestershire closed long before they had any industrial interest. Indeed it is extremely unlikely that any enthusiast ever visited the line in its working life, which ceased almost forty years ago. What a wonderful treat was missed as, scenically, this must have been one of the finest quarry railways in the Midlands. A few years ago at a meeting in Nottingham a gentleman named Hurst (or Hirst?) 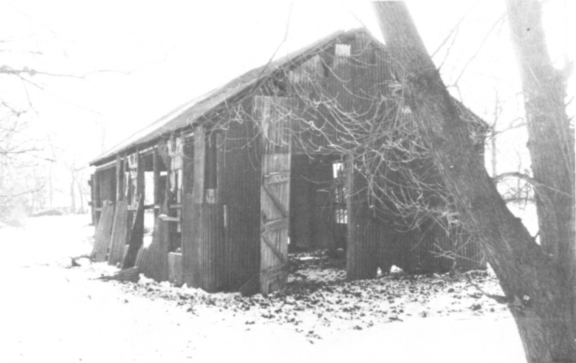 whom I had never met before, gave me a photograph of the old loco shed at Wartnaby, and I made a mental note to go again sometime to see if the building was still standing. I did so on Friday, 22nd November 1968. It is always best to make visits to long defunct concerns in the winter months when the undergrowth has died down. The Barton bus from Nottingham dropped me at Nether Broughton, where a two mile walk took me to the now closed Old Dalby station. Here the Army Depot railway makes connection with the goods yard and beyond is still one of the sidings of the group that formerly served the ironstone quarries. On the north side there was a tipping dock. Nothing of the latter is to be seen but the formation of the rope-worked incline running obliquely up the steep slope is still perfectly clear all the way to the summit, where it cuts through a corner of Marriott's Spinney. On the level ground by the trees is the loco shed with a small pond at one side. The 6in O S map of the period shows two buildings, the loco shed and another labelled "Smithy", traces of the foundations of which can be seen. The loco shed itself is of unusual construction and worth examining. Along each side are four cast-iron cylindrical pillars, with small horizontal girders between them; iron-framed windows of twenty panes are set in wooden frames, three to each side, the remainder of the wall space being occupied by black corrugated iron. The doors are of wood, a large one facing the quarry and a small one at the rear. The roof is of corrugated asbestos, and there seems to have been one "pot" now gone. The situation is delightful; the belt of trees behind the shed building, the pond at the side, and to the north the steep brush-covered escarpment commanding a magnificent view over the Vale of Belvoir. What a site for a photograph of a three foot gauge loco shunting wagons at the head of the incline! Beyond the buildings the line curved east-north-east running in a shallow cutting now filled with trees and bushes. It was elevated to cross the Nether Broughton-Saxilby road (the bridge has long since been pulled down) and beyond ran on a grassy embankment enjoying a wonderful view over the Vale, before turning east in a shallow cutting towards the Ab Kettleby road; another pond is passed and the line entered a grove of trees and finally reached the road by a group of buildings referred to as "Stonepit House". Just before this, a branch turned off south, crossing the road by a level crossing between a couple of modern bungalows. The "Stonepit", I fancy, is a lot older than the tramway, suggesting a quarry for building stone, not iron extraction. Beyond this point ground on both sides of the road has been quarried, and there were two more level crossings, no obvious traces of which now remain. 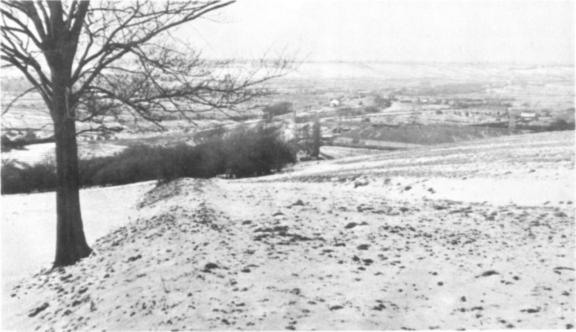 The quarrying area is revealed by the shallow depressions in the fields so characteristic of the old outcrop ironstone quarries in the Marlstone beds of Leicestershire. The lines serving these quarries were slewed as required. However, the main tramway was a permanent feature and is still readily traceable from end to end, as described, though it has been lifted for close on forty years; rather a contrast to systems such as Scaldwell and Pitsford, closed in the 1960's and bulldozed out of recognition. There are now no locos at Wartnaby nor ever likely to be. But with such obvious traces it is still not hard to conjure up nostalgic pictures of neat little engines chuffing across the fields with a rake of wooden tubs bumping along behind. 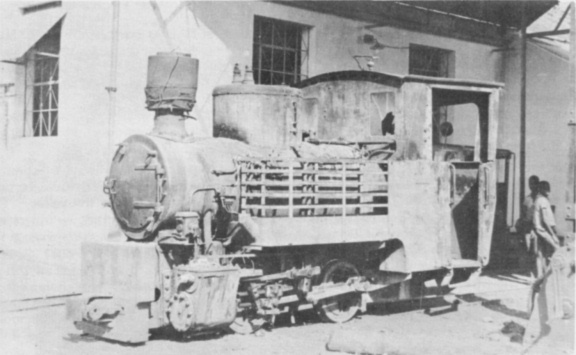 The above photograph of SLM 3854 at Companhia do Boror in Mocambique was omitted in error from page 124 of RECORD 26.